This recipe originated as a vegetarian kale and potato soup from the cookbook Laurel’s Kitchen. When Jesse and I first started making it together (sometime in 2007ish, I would guess), we soon modified it to include a hearty helping of breakfast sausage. When I make soup, I want it to be filling enough to make up the entire meal, which this recipe certainly accomplishes when you include the sausage. More recently, I also started substituting chicken broth for the water or vegetable stock called for in the original recipe–a modification that makes this soup both more flavorful and more nutritious. If you don’t think that you particularly like kale, I’d still urge you to give this recipe to try. I’m generally not a big fan of kale, but I absolutely love it in this soup. Steaming it separately mitigates that really strong kale flavor, and something about immersing it in broth makes the texture much appealing than I’ve ever found any kale side dish. Saute onions in refined coconut oil (or your other cooking oil of choice) in a Dutch oven or soup pot. When onions begin to turn translucent, add pork breakfast sausage. Cook breakfast sausage, breaking up meat into small clumps as it's cooking, until cooked through. Add minced garlic and cook for a couple minutes, until the garlic is just barely beginning to brown. Add broth and the diced potatoes. Bring soup to a boil and then reduce heat to a simmer. Simmer until potatoes are soft. After the potatoes are fully cooked, gently mash about half of them with a fork or similar tool to thicken the soup. Add kale to your soup pot. Add nutmeg, salt and pepper. If your soup no longer seems brothy enough (we like it thick, but still definitely liquid), add water or additional broth until you reach your desired consistency. Serve and enjoy! ← My Coconut E-Book is Here!! This is one of my favorite soups. I like to make it with the Spanish-style lamb chorizo made by one of our local farmers. 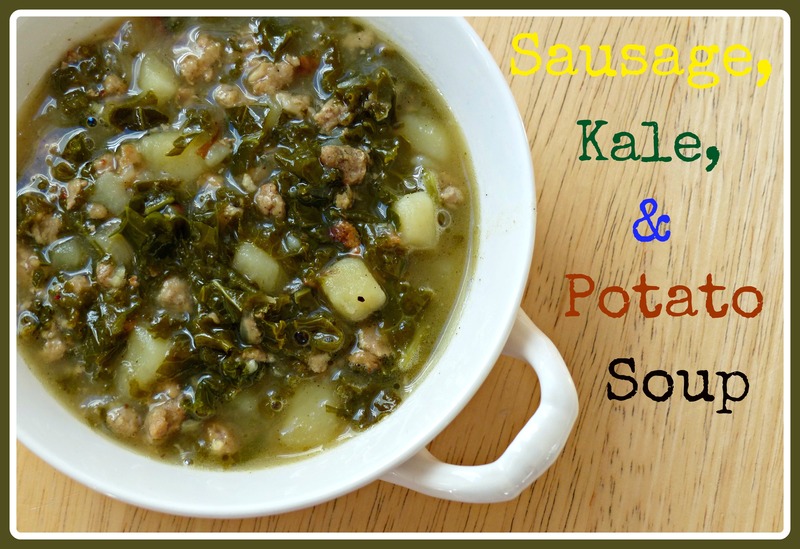 This soup is the only way my older son will eat cooekd kale! Yum! Love this soup! I think vegetarian soup recipes are worth looking at, because really good vegetarian cooks know how to get incredible flavor from herbs and vegetables. Easy to adapt them to your diet, as you have with this soup.